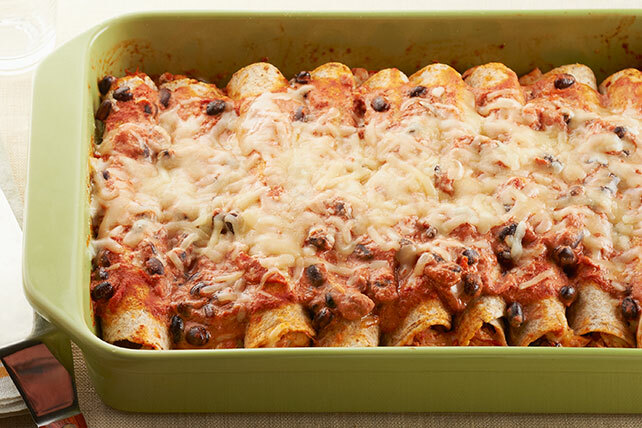 A cheesy chicken mixture is rolled up in whole wheat tortillas and topped with still more cheese in this easy-to-make baked enchilada dish. Mix cream cheese spread, seasoning mix and milk in medium bowl until blended. Stir in tomatoes and beans. Combine chicken, 1/3 cup shredded cheese and 3/4 cup cream cheese mixture. Spoon 1/4 cup down center of each tortilla; roll up. Place, seam sides down, in 13x9-inch baking dish sprayed with cooking spray. Top with remaining cream cheese mixture and shredded cheese. Set out bowls of chopped lettuce, fresh tomatoes and avocados so everyone can help themselves to their favorite toppings.